Seizures with fever. Most times when we discussed seizures in the setting of fever on our blog, we either referred to simple Febrile Seizures or genetic syndromes such as Dravet Syndrome, which characteristically present with fever-associated seizures. However, if a child or an adult presents with a first seizure in the setting of a febrile illness and shows recurrent seizures or does not get back to baseline quickly, we are usually concerned about infections of the brain. Herpes simplex virus (HSV) encephalitis is one of the more common infections, which may result in significant impairment if not treated rapidly. A recent publication in Neurology reminds us of the genetic susceptibility of HSV encephalitis and suggests that predisposing genetic alterations can be found in an appreciable number of patients. Discovery. At first glance, it might not make much sense to look for genetic risk factors in patients with brain infections. The virus is the causative agent and explains the disease. Why would we need to look for anything else to explain this condition? On second glance, however, we realize that there is plenty of room for genetic factors to contribute to the entire picture – HSV infection is common, but only very few patients have invasive infections of the Central Nervous System (CNS). Why do some people manage to fight off the virus, while others have active infections of the CNS? Casrouge and collaborators first addressed this issue in 2006 when they discovered homozygous loss-of-function mutations in UNC93B in two consanguineous families, each with a single patient suffering from HSV encephalitis. Their discovery was based on the epidemiological investigation that many patients with HSV encephalitis were from consanguineous families suggesting recessive inheritance. Also, they identified an immunodeficiency in these patients, which paralleled the findings in the UNC93B knock-out mouse. After this initial discovery, other genes were identified including TLR3 coding for the Toll-like receptor 3 and the TRIF, TRAF3, and TBK1 genes. What do these genes have in common? They represent components of the TLR3 pathway. TLR3. The Toll-like receptor 3 plays a role in innate immunity, the part of our immune system that does not rely on antibodies, B cells, or T cells. The innate immune system is an old, very powerful defense system that kicks in when the organism is confronted with viruses or other pathogens. TLR3 recognizes pathogen-associated molecular patterns, i.e. protein or DNA features usually found in viruses. TLR3 in particular recognizes double-stranded RNA, which is found in many viruses. Once the TLR3 pathway is activated, it leads to an immune response through interferons. It is conceivable that organisms are more susceptible to viruses if this basic immune response is disabled. However, are patients with defective innate immunity rare or does this present a more common finding in patients with HSV encephalitis? This is the question that Lim and collaborators tried to answer. Frequency. Lim and collaborators focused on mutations in TLR3 in their current study and sequenced this gene in 120 patients with HSV encephalitis. They could demonstrate rare variants with functional effects in 6/120 patients (5%). For most of these mutations, they demonstrated that the TLR3 response is decreased when assessing patient fibroblasts. Finally, they observed that the presence of a TLR3 variant is a good predictor for HSV encephalitis recurrence – 4/6 patients with TLR3 deficiency had a relapse, whereas recurrence was only found in 10% of patients without a TLR3 variant. 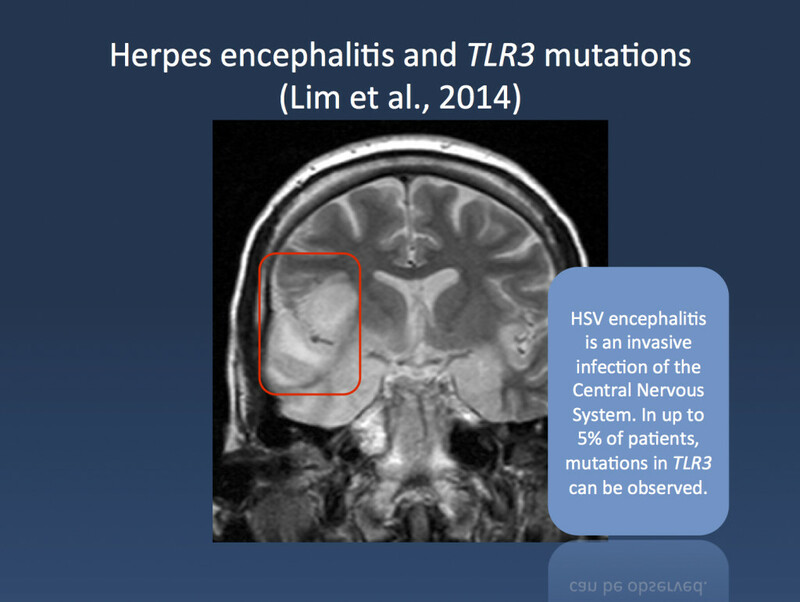 These findings may suggest that TLR3 sequencing in patients with HSV encephalitis may have some clinical utility to identify patients who may carry a predisposition for a recurrent infection. What you need to know. Genetic risk factors are not only relevant in patients with genetic epilepsies, but may also help us explain why some patients may have a predisposition for particular CNS infections. With a frequency of up to 5% in patients with HSV encephalitis, there might be some utility in testing patients for TLR3 deficiency when presenting with HSV encephalitis to assess the risk for recurrence. This entry was posted in 2014, Epileptic encephalopathy, Ideas, Publications and tagged Captain Crunch, CNS infection, febrile seizures, herpes simplex, immune response, innate immune system, symptomatic epilepsies, TLR3, varicella zoster. Bookmark the permalink.